One week out from your wedding day all the wedding attire for both the bride and groom will be ready for collection. Someone also needs to be responsible for all of the bridal parties wedding attire. 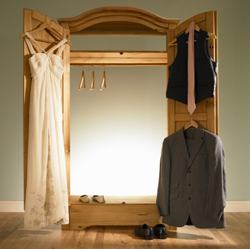 Since the men and women will be getting ready in different locations on the wedding day, it is best to have someone assigned to looking after the outfits for both groups. This is something that should be organised so nothing is forgotten or left behind on the day. Collecting the wedding attire should be arranged with the suppliers and special arrangements will of course be made in a hire situation. Your chosen supplier will be able to direct you on what is required of you. They will also advise you of the dates the attire is available for pick up and the requirements for after the wedding, including return dates. 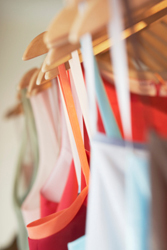 Since weddings are generally held on a weekend collection is organised a day or two prior to the weekend of the wedding. Return of the hired outfits is usually on the next working day following the wedding. If you have any questions be sure to ask your suppliers. You should consider arranging for a friend or family member to be responsible for the return of the hired wedding attire if you leave for your honeymoon immediately following the wedding. Fees will of course be incurred for any missing items by the suppliers and therefore it is strongly recommended to have someone specifically in charge of this duty to avoid any extra costs. Make a list that you can check off to help you ensure that you have the correct amount of each of the items. 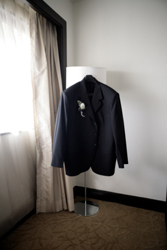 This will help to double check that you have all of the hired items before returning to the suit hire store. 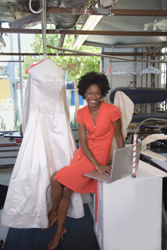 Likewise you may wish to organise for someone to take care of the dry cleaning of any other purchased wedding attire such as the wedding dress for safe keeping and preservation while you are away on your honeymoon. 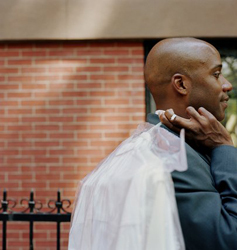 A professional dry cleaner will package the wedding dress that will protect it and use special paper to wrap the dress to avoid discolouration. Consider having the wedding shoes professionally cleaned also to ensure they are kept in the best possible condition.